The Alamo Area Council operates trading posts at all camp properties during most council outdoor adventures. Refreshments, camp souvenirs, advancement materials, branded camp and BSA products, and more. This eSales site is an extension of our trading posts. 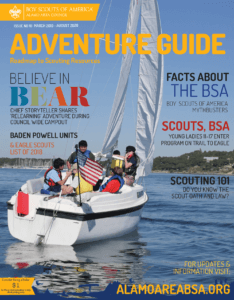 The eSales site is the online Retail site for Boy Scouts of America, Alamo Area Council products only, including branded items for Bear Creek Scout Reservation, Mays Family Scout Ranch, and McGimsey Scout Park. For help with our eSales site, contact the Alamo Area Council at eSales@AlamoAreaBSA.org. Visit the Musselman Scout Shop site by clicking HERE. All product prices listed include any applicable taxes. All sizes available while supplies last. Shipping Feature Will Be Added in the Near Future. For now, All products purchased online must by coordinated for “pick up” through your District Executive (DE) at one of ten District Informational Meetings called “Roundtables” held the first Thursday of every month. Like these T-Shirts?!?! Purchase them here!